Weaver® W-Pro10 Red Certified Overhead 2 Post Lift - Derek Weaver Company, Inc.
For warehouse pick up at our Texas or North Carolina Warehouse call for pick up price ($2549.00), make payment and schedule a pick up appointment..
1) The W-Pro10 is manufactured for Weaver® Lift by the VSG subsidiary of the Fortune 500 Dover Corp. (NYSE:DOV) Based Here, Certified Here and Insured Here in the USA. VSG/Dover is the Largest Lift Manufacturer in the World and enjoys over 80% marketshare of the car dealer business in this country. Why? Because they take care of business, before, during and especially after the sale. You simply cannot get the "Peace Of Mind" from any other lift manufacturer that you have when you own a VSG/Dover product. Adjustable Overall Height to fit under a 12’ ceiling or an additional 6”. Now, lift buyers that need a 10,000-lb. capacity Car Lift can buy the Certified W-Pro10 at a Non-Certified Price. The Weaver® Lift W-Pro10 is proudly manufactured by Dover Corp.'s Vehicle Service Group (VSG). VSG comprises nine major vehicle lifting and collision repair brands: Rotary Lift, Chief® Automotive Technologies, Forward® Lift, Direct-Lift®, Hanmecson®, Revolution® Lift, Elektron, Blitz® and nogra®. Based in Madison, Ind., VSG has operations worldwide, including ISO 9001-certified manufacturing centers in the U.S., Europe and Asia. After researching 2 post lifts, it looked like this lift was the best product for the money. Now that it’s installed and I’ve used it, I feel like i made the right choice. Construction and material quality is great. It got a little beat up getting to me with some scuffs and scratches but nothing I can’t live with it. As has been mentioned by others, the instructions are not the best, but I got through it and if you call or email, Dan will gladly help you through any issues. I have to say that so far I'm very happy with my purchase. I wasn't missing a single part or piece of hardware. The directions were reasonably easy to follow and I installed the whole thing by myself in about a day. Like I said, so far so good. Only time will tell how it holds up. If I found one issue to note, and this is splitting hairs, it would be the arms being too short. My hoist is adjustable in width and I chose to install it as wide as possible. On small cars it doesn't always reach to lifting point I would like it too. But then again, I haven't had any issue with the alternative lift point either. if you work on automobiles frequently you will not regret this purchase. It has made my life so much easier! I am totally pleased with the whole experience with Weaver Lifts. Started with ordering from Mara, pick up at factory, to the technical assistance from Dan. I only had one minor issue with parts, missing (4) 5/16 x 18NC x 5/8" screws. No big deal, I had some in my bolt bin. Install was a breeze however in my case with my shop already I was unable to preassemble on the ground as instructions guide you. This process took a bit longer but same end result - - Great lift. AS others have said, wish I had bought 20 years ago. Kudos to Dan for your technical assistance. You're the Man!!!!! Should have bought 12 years ago when I built my garage. It went together very quickly. Instructions are not great but can work through it. I have lifted several different vehicles with ease including trucks. Lifting arms have great mobility and can reach anywhere. The locks for the arms are automatic and are out of the way. Great addition to the garage. Great customer service and support. Highly recommend Weaver Company. I am happy so far will post a review latter on in the year. Best move I ever made. Great quality. Wish I would have bought it 20 years ago! I've used this lift in our shop for one year. The shipping was fast to my local freight terminal. The assembly instructions weren't that bad, I put it together in an afternoon (had help standing the columns). All the components seemed well built. Lift has held up well under daily use. It's incredibly sturdy. I regularly use this lift to hoist full size pickups. Looking forward to many years of service from this lift. Fast shipping. Lift is very well engineered and superior quality. It was easy enough to install. I looked at the specs of several available lifts and the steel posts are bigger and thicker. I'm very picky and thorough and I like it! The company will answer the phone and talk with you about any installation questions you might have. Installation went well and instructions were fair. Actual materials seemed very good quality. Extremely well built and safe. The assembly instructions could use more pictures and better description in the assembly steps. Try to find a better value! This was my first lift purchase, after doing research on what's available for at least a year. It'll be used for general repairs, and classic car work. I wanted a good, certified 10K lift. I was surprised by the quality of this lift. Near perfect welds and powder-coated finish. Great design with big beefy carriages and lift arms. Add in the top notch customer service from Derek Weaver, and I couldn't be happier with my purchase. Great Lift!!! Better than I expected. I'm a 30 year Honda master tech. I'm in biz. restoring classic cars now. 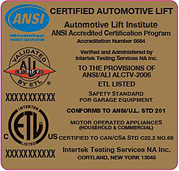 I looked and looked found weaver web site and researched this lift and the price was good its certified. I installed it my self with no problems. It works great!! The material its made from is top notch...I would put this lift up against any top name brand lift that cost almost twice as much.. I have a GMC quad cab 3500 dually truck lift with no problem. The lift is extra wide and tall. Truck had plenty of room to open the doors.. This was my first lift. Picked it up at the warehouse and installed it myself. Installation instructions were not very helpful, but cleared up problems with a call to technical help desk. Very impressed with the quality and operation of the lift. As a 30 year tech and have used and installed numerous brands of lifts. This lift offers quality and usability in a affordable package. The people at Derek Weaver are outstanding! This lift was very easy to set up and works great. Lift is even better than expected! The lift works flawlessly, it is so smooth compared to other lifts I have used. The fit and finish is top notch, I am very impressed. If I have any complaint at all it is with the install instructions as I felt some areas were a little vague. Overall I give my experience with my new lift, from the ordering, my picking it up at the warehouse, to the final product 10 out of 10 stars! I installed this lift in my shop to replace a #7000 lift. I am really happy with the final product. Shipping took 1 day. The assembly process went smoothly and took around 4 hours with two people. One hint that I have is break free the bleeders on top of the cylinders before you put a oil in. Mine were super tight and I had to use an impact to break them loose. Of course it spun the bleeder all the way out and I oiled up the lift and the floor real good. Bought my son Weaver PRO10 Certified two post lift about a year ago. He is a Certified Master Tech Nissan Technician and this is the lift he wanted at home. He had done his research and he has used a lot of lifts in his career. He has bragged on it so much I had to buy one for myself. Installation is very easy but like stated a little more information would be useful. The main thing is the people at Derek Weaver. Real people and very friendly however they are from Texas so it comes natural. Not my only purchase Also have tire changer and tire balancer. Both great products and always for the years I have dealt with the people great service. I did not have it shipped. I picked it up at the warehouse and had a great experenice. Have only had the lift up for about two weeks and it has already saved me money and works fantastic. It was easy to put up, but directions need a little work.I have the Weaver PRO10 Certified two post lift. The shipping was very fast. This lift is a good quality product, all the components seam to be very well built, the arm lock system is a good touch. Directions for assembly could be impoved, but other than that a great product. The company is very friendly and helpful.I have a 4x4 truck lift on it with front diff.removed right now. No problem. I'll start by saying we shopped for a lift about a year before buying from Derek Weaver.The reasons why a Weaver lift,simple, Derek Weaver Co. is a real Co. with a real location,and real people working there,unlike the others on the net!! The people where the real reason,very help full,they know the product and are willing to take the time in helping you with your lift needs,Carol was the one factor in making up my mind as to where to buy my lift! !Now the lift,top quality, very nicely made,well constructed, install was made simple by Carol,she recomended an installer that was great, if I had it to do over,would not wait one second buying from the Weaver Co.give them a call you will not be sorry! After looking at lifts for about one year I choose the W-Pro10. I felt more confident since It was built by Dover Corporation. The lift is sturdy and will lift my F250 crew cab with ease. I installed it myself and everything turned out great. I would like to see the hydraulic hoses run on the outside of the unit. They are on the inside but shielded from the carriage. I would Highly recommend this lift. I am very pleased with the customer service that Donna, Carol, Doug and Derek gave me. I've had this lift for 2 weeks and it is better than expected. I didn't know if it would be a watered down Rotary lift, but this lift is extremely well built and has no problem lifting my 1 ton Ford (9200 LB. with tool boxes). It is as good of quality as the Rotarys we had at the dealership at a great price. I would recommend this Weaver lift for any shop. The company is easy to communicate with and Doug really knows the product well. Great lift easy to use. Oversized Tall Carriages spread out the load with Cable Adjustment Access, Rubber Door Guards and Automatic Heavy Duty Arm Restraints. Power Side Column with Single Point Lock Release, ALI Graphic Safety Decals and Storage for Height Adapters (on both columns). W-Pro10 Power Unit, Single Point Safety Lock Release and Height Adapter Storage. Offset 3-Stage Front Arms and 2-Stage Rear Arms allow easy Asymmetric or Symmetric loading. Weaver Lift W-Pro10 with arms swung back for Asymmetric Loading. Weaver Lift W-Pro10 with arms spread open for Symmetric Loading. Dover's Proven Safety Lock Latch Assembly. Protected Cable Pulley Guards and Internal Column Hose Guard Protection.